Just over a year after he was maimed for gnawing on someone's shoes, Cola is romping across a beach on new sleek paws: curved "blade runner" prosthetics. This photo taken on December 12, 2017 shows John Dalley fitting Cola the dog with his new curved "blade runner" prosthetic legs at Soi Dog Foundation in Phuket. Just over a year after he was brutally maimed for gnawing on a neighbour's boots, Cola the canine is romping across a Phuket beach on sleek new paws: curved "blade runner" prosthetics modelled after those used by Paralympian sprinters. The former street pup nearly lost his life last year after a Bangkok man hacked off his front legs with a sword in revenge for chewing up his boots. A quick trip to the vet saved Cola but left him with two amputated, kangaroo-like stumps for front paws. Today, his tongue is lolling about and his tail is wagging wildly as he bounds across the sand on carbon-fibre blades, similar to those made famous by Paralympian runner Oscar Pistorius. The lightweight legs were tailor made for the high-energy hound, who loves to run. “(These legs) give him a lot more balance, a lot more spread,” said Cola’s owner John Dalley, who founded the Thailand-based “Soi Dog” foundation that helps strays. He and his late wife rescued Cola after the attack and brought the dog down to the beaches of Phuket. “It’s actually quite amazing how adaptable dogs are and how forgiving they are,” he said as Cola, who shows no fear of humans despite his trauma. curled up around his feet. While other dogs have been fitted with a variety of prosthetics, Cola is believed to be the first to receive the pricey “suspended” blades. The blades curl up in a “C” shape, while the amputated limbs rest in a silicon socket. 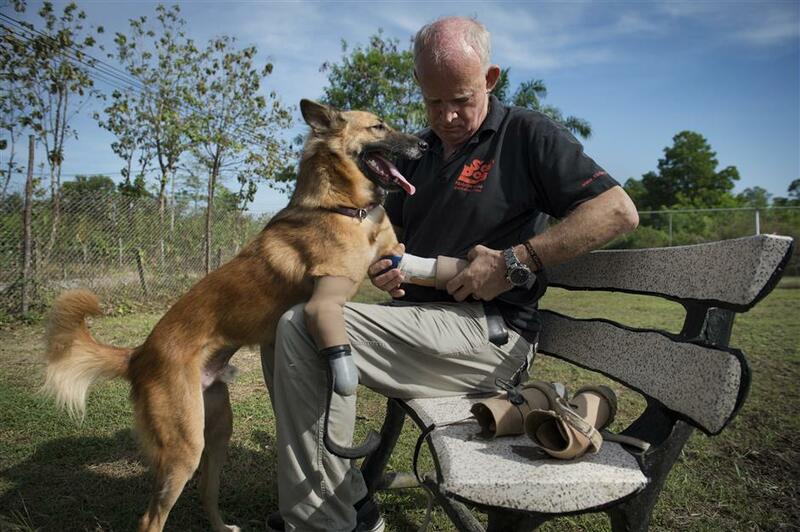 Cola’s prosthetics were developed by orthopaedist Bendt Soderberg, who works at a hospital in Phuket, and are still being fine-tuned to fit the mutt. “What we wanted to achieve was something that was not so heavy, that could be a bit flexible in the feet so that when he jumps and bounces they would not be completely stiff,” said Teddy Fagerstrom, director of the orthopaedic lab.